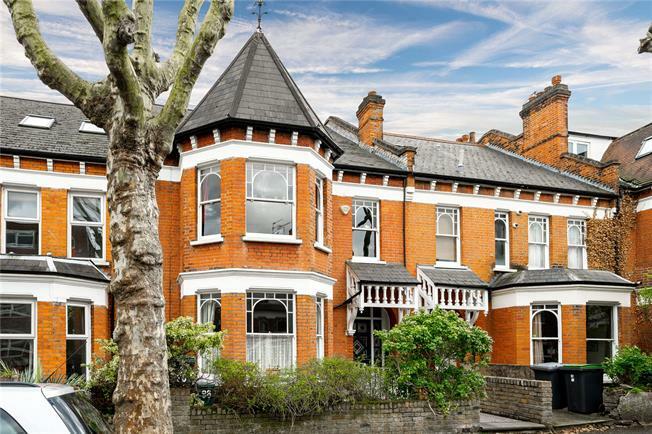 6 Bedroom Terraced House For Sale in London for Asking Price £1,850,000. A beautiful six bedroom period property with an abundance of authentic period charm and character. The welcoming entrance hall has the original stained glass windows in the front door and side panels, whilst the front reception room has a mass of natural light from large bay windows, working fireplace with tiling surround, ceiling rose and cornicing. The rear reception room has orginal fireplace and ornate floor to ceiling double doors and windows which lead to outside. Folding doors allow the two rooms to become one or left separated; perfect for entertaining or cosy nights in respectively. There is a separate kitchen and breakfast area which also has direct access to the garden, separate WC and access to the cellar for storage. Upstairs, a split level is home to the first of the bedrooms, which has a bright south facing outlook over the garden, whilst the first floor proper has three further bedrooms including two of the principal rooms; the one at the front also has a large bay window whilst at the rear, the outlook starts to take in the far reaching skyline views. The upper floors have one further double bedroom and two family bathrooms, walk in storage which offers further conversion potential subject to permissions, whilst the uppermost bedroom/study takes in the best panorama which includes many of central London’s most recognisable landmarks including the City and Canary Wharf. Outside, the south facing garden has both hard stone and lawn areas along with mature shrubs and borders. Mount View Road is just 0.2 miles from Haringey train station which provides swift access into the City, as well as the West End via the tube links at Finsbury Park and Highbury & Islington. There are an excellent number of places to eat, drink and shop at nearby Crouch End and Stroud Green along with local shops next to the station. The open green spaces of Finsbury Park and Alexandra Palace and Park are a short journey whilst there are numerous schools in both the private and public sector nearby.